Subject:- Simplification of Pension Procedure -submission of Life Certificate. Attention is invited to CPAO’s OM No. 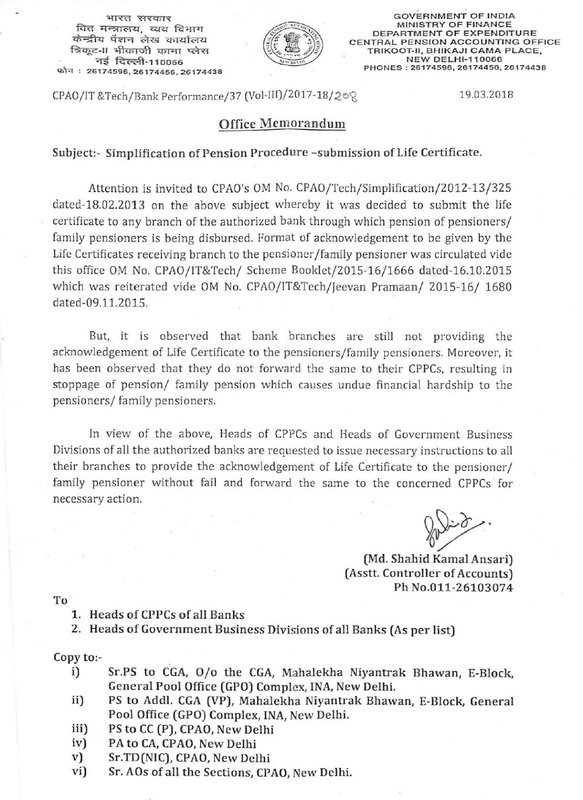 CPAO/Tech/Simplification/2012-13/325 dated-18.02.2013 on the above subject whereby it was decided to submit the life certificate to any branch of the authorized bank through which pension of pensioners/ family pensioners is being disbursed. Format of acknowledgement to be given by the Life Certificates receiving branch to the pensioner/family pensioner was circulated vide this office OM No. CPAO/IT&Tech/ Scheme Booklet/2015-16/1666 dated-16.10.2015 which was reiterated vide OM No.CPAO/IT&Tech/Jeevan Pramaan/ 2015-16/ 1680 dated-09.11.2015. But, it is observed that bank branches are still not providing the acknowledgement of Life Certificate to the pensioners/family pensioners. Moreover, it has been observed that they do not forward the same to their CPPCs, resulting in stoppage of pension/ family pension which causes undue financial hardship to the pensioners/ family pensioners. In view of the above, Heads of CPPCs and Heads of Government Business Divisions of all the authorized banks are requested to issue necessary instructions to all their branches to provide the acknowledgement of Life Certificate to the pensioner/ family pensioner without fail and forward the same to the concerned CPPCs for necessary action. 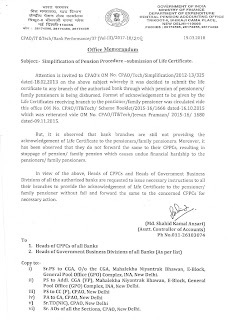 CPAO to Banks: issue necessary instructions to all their branches to provide the acknowledgement of Life Certificate to the pensioner/ family pensioner without fail and forward the same to the concerned CPPCs for necessary action.